A comparative study on the triterpene saponins of 47 samples of Ginseng drugs derived from 12 Panax taxa was conducted using a reverse-phase high-performance liquid chromatography (HPLC) method. 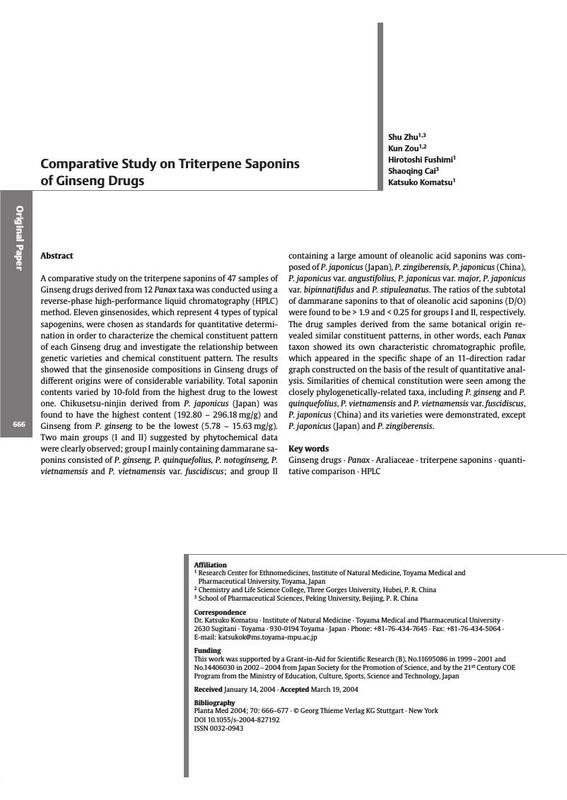 Eleven ginsenosides, which represent 4 types of typical sapogenins, were chosen as standards for quantitative determination in order to characterize the chemical constituent pattern of each Ginseng drug and investigate the relationship between genetic varieties and chemical constituent pattern. The results showed that the ginsenoside compositions in Ginseng drugs of different origins were of considerable variability. Total saponin contents varied by 10-fold from the highest drug to the lowest one. Chikusetsu-ninjin derived from P. japonicus (Japan) was found to have the highest content (192.80 - 296.18 mg/g) and Ginseng from P. ginseng to be the lowest (5.78 - 15.63 mg/g). Two main groups (I and II) suggested by phytochemical data were clearly observed; group I mainly containing dammarane saponins consisted of P. ginseng, P. quinquefolius, P. notoginseng, P. vietnamensis and P. vietnamensis var. fuscidiscus; and group II containing a large amount of oleanolic acid saponins was composed of P. japonicus (Japan), P. zingiberensis, P. japonicus (China), P. japonicus var. angustifolius, P. japonicus var. major, P. japonicus var. bipinnatifidus and P. stipuleanatus. The ratios of the subtotal of dammarane saponins to that of oleanolic acid saponins (D/O) were found to be > 1.9 and < 0.25 for groups I and II, respectively. The drug samples derived from the same botanical origin revealed similar constituent patterns, in other words, each Panax taxon showed its own characteristic chromatographic profile, which appeared in the specific shape of an 11-direction radar graph constructed on the basis of the result of quantitative analysis. Similarities of chemical constitution were seen among the closely phylogenetically-related taxa, including P. ginseng and P. quinquefolius, P. vietnamensis and P. vietnamensis var. fuscidiscus, P. japonicus (China) and its varieties were demonstrated, except P. japonicus (Japan) and P. zingiberensis.